Our Hall of Famers now welcome you to your Mississippi Sports Hall of Fame and Museum. File this one under: PLEASE, PARDON OUR PROGRESS. We have lots of it to report at your Mississippi Sports Hall of Fame and Museum. The coming week — specifically August 24-28 — the museum will be closed while we re-carpet the main arena. We will reopen for visitors on Saturday, August 29, a little brighter and cleaner. This comes on the heels of our most successful BancorpSouth Induction Weekend in the museum’s history. We had more than 800 to dinner. Famers, debuted on induction weekend. The first six Hall of Famers feature: Charlie Conerly, Boo Ferriss, Peggie Gillom, Bailey Howell, Walter Payton and Jerry Rice. The banners, which are lighted at night, will be changed out on a quarterly basis and add much to the appearance of the museum. We can store the banners and much more memorabilia because of our new 2,000-foot storeroom, which visitors won’t notice but will do wonders for our operations. We were recent recipients of a generous grant from the Billy and Rebecca Long Foundation, which is going toward new exhibits. The first of those is already operational in the museum locker room. It’s a video presentation that takes our visitors into a real locker room, with actual locker room scenes featuring Mississippi coaches. For instance, you can see Hugh Freeze’s pre-game talk to his Ole Miss Rebels before last season’s historic win over Alabama and Dan Mullen’s congratulatory speech after the No. 3 Bulldogs knocked off No. 2 Auburn to reach No. 1 in the nation last year. There are many more. Since its inception in 1996, the museum has featured a splendid introductory film in our theatre. But much has happened in 19 years, including the advent of high definition. With another generous grant from the Gertrude Ford Foundation, that new film is in the works. We hope to debut it sometime early 2016 in what will now be the Gertrude Ford Foundation Theatre at the MSHOF. Finishing touches are being put on the script. Filming has begun. 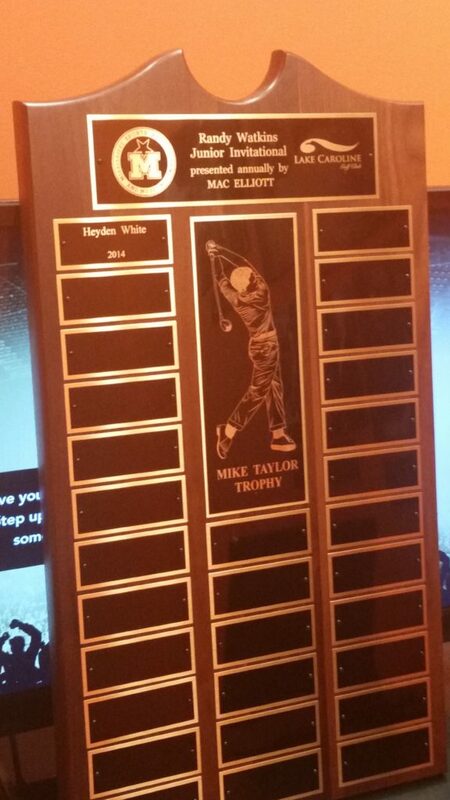 Last fall, the MSHOF joined with Randy Watkins Golf and Hall of Fame and golf supporter Mac Elliott to create the Mike Taylor Trophy, which goes annually to the winner of Watkins’ annual junior invitational tournament. Taylor, a Hall of Famer, is the most successful male amateur golfer in Mississippi history. The permanent plaque, which features Taylor’s finish as a junior golfer, hangs just outside the Sanderson Farms golf exhibit room in the main arena. The Randy Watkins Junior Invitational, the brainchild of Watkins (a former U.S. Junior PGA champion), has become a regional tournament, giving Deep South juniors an opportunity to keep their games tournament-sharp in the fall. This year’s golf tournament is set for Oct. 3-4 and will feature an Oct. 3 banquet at the MSHOF. Our entrance exhibit has been switched out to the Class of 2015. You’ll find uniforms, trophies, photos, etc of Mike Dennis, Brett Favre, Steve Knight, Fred McAfee, Clarence Weatherspoon and Gwen White. We’ve also enlarged our museum store to include the entire entrance area. 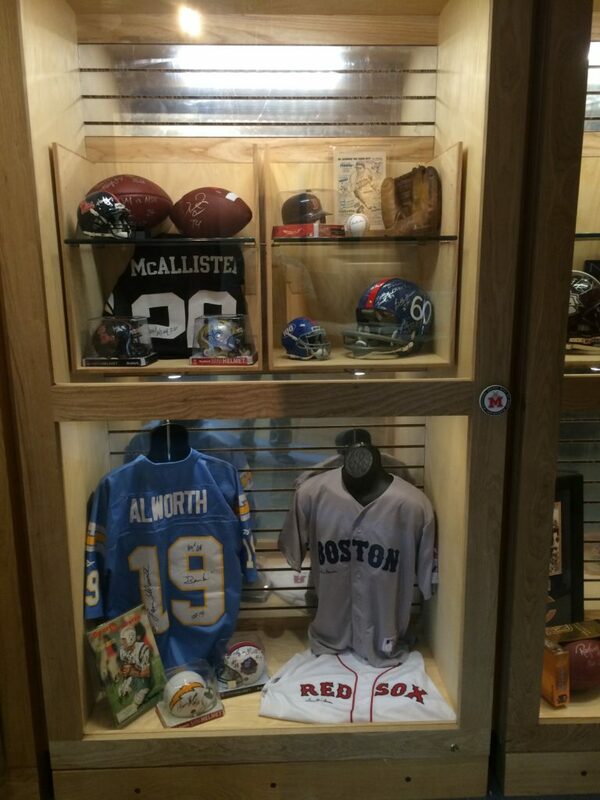 On sale in lovely, new cases are sports memorabilia items, featuring Mississippi Sports Hall of Famers and others. (The Favre stuff is going fast.) Proceeds go to support the museum. We anticipate a busy fall with the Sept. 23 program celebrating the 35th anniversary of “State 6, Bama 3” — one of the most memorable and meaningful games in Magnolia State football history. Click here for more information on that. The C Spire Conerly Trophy presentation, which includes the awarding of the Kent Hull Trophy, is set for Dec. 1. Much will happen and thousands will visit your MSHOF before then. Former Jackson Mets and Generals general manager Bill Blackwell, no stranger to Jackson or the Mississippi sports scene, has joined our staff as Chief Operations Officer. He brings a world of sports business experience to the Hall. Much is happening. Come visit! To support your MSHOF and Museum, please click here. Deuce, Lance, Boo and many more have signed memorabilia at the museum’s expanded store.